In 2007, the Harper government promised to refurbish a mining installation in Nanisivik into a deep-water berthing naval facility to support Arctic operations. Over the years, the scope of the program was reduced to a simple refueling facility which is still not operational. It may be time to revisit the plan altogether in favor of improving the more useful and extensive federal facilities in Resolute Bay. The facilities at Nanisivik are over 100 kilometers from the Northwest Passage and could not accommodate other sensors to monitor maritime activity in the Passage. The runway supporting the site was closed in 2011 in favor of the Arctic Bay airport some 30 kilometers away. The road between the airport and the berthing facility will not be maintained in the winter and will be very expensive to maintain in the summer for limited use. 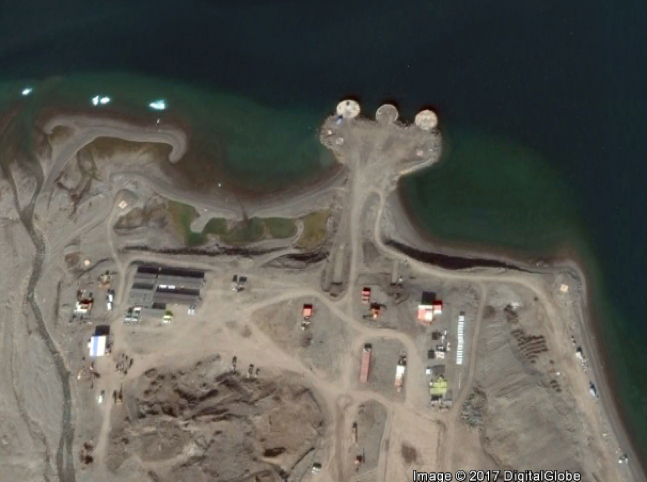 Nanisivik berthing facility – Google Earth. On several occasions, I recommended that Resolute Bay be developed as a major government Arctic security hub. Global warming continues to make the waters of the Arctic Archipelago more accessible to maritime traffic. The National Snow and Ice Data Center reported that in 2016 there were several monthly records in terms of lost sea ice. Between 2000 and 2015, the number of full transits of the Northwest Passage has grown approximately by 400 per cent. At least 13 cruise ships plan to visit the Arctic Archipelago, including Crystal Serenity which will again transit the Northwest Passage with over 1,500 people on board, raising concerns about our ability to deal with a potential large search and rescue operation. It has also been reported that the Chinese government has published a book on how to navigate the Northwest Passage, a clear indication that they plan to do so when it becomes more and more accessible. Clearly, maritime activity continues to increase. It would be useful to review once more why Resolute Bay could be developed as a federal security hub in the Arctic. It is centrally located in the middle of the Arctic Archipelago and sits on both the classical Northwest Passage and the most used of the seven possible transit routes. From there it would be easier to monitor activity in the Arctic as well as support search and rescue, environmental responses and safety and security operations. Resolute Bay already has a number of federal assets in place. These provide an excellent base from which to develop an imposing security hub located at the geographic centre of Canada’s Arctic Archipelago. Furthermore, Resolute Bay is located on the southern edge of Cornwallis Island where the Northwest Passage is only 33 kilometers wide. Any surface or subsurface vessel using the Northwest Passage would have to sail past Resolute Bay. While vessels could potentially use the very narrow strait between Somerset Island and Boothia Peninsula to avoid detection, the narrowness of this strait would discourage most, and it could easily be monitored remotely from Resolute Bay. Resolute Bay needs to be developed as a multi-departmental facility that would include an all-season paved runway supported by modern instrumented approaches, a long-range air traffic control radar, sub-surface monitoring devices, a polar orbit satellite download farm, a ship and aircraft refueling capability and a protected docking facility. This multi-purpose facility would house the seasonal presence of multiple federal government departments. The Canadian Forces already have a Ranger Patrol and their Arctic Training Center. A paved runway could support a forward operations base for the Aurora Long Range Maritime Patrol aircraft, CF-18s and Unmanned Arial Vehicles (UAV) used for Arctic surveillance. The enhanced runway and related facilities would improve the Canadian Forces’ and Coast Guard’s search and rescue capabilities and meet our commitment under the Arctic Council Agreement on Cooperation on Aeronautical and Maritime Search and Rescue in the Arctic. Underwater sensor monitoring devices in that natural choke point would allow the detection of submerged vessels. The Resolute Bay location would support the operations of the Arctic Offshore Patrol Ships and facilitate the deployment of naval boarding parties to deal with a rogue vessel. 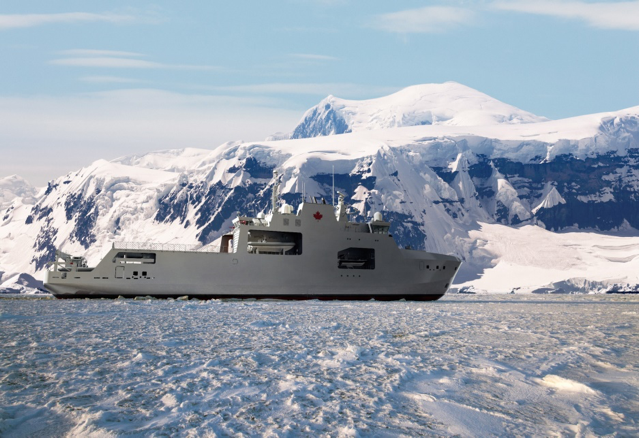 Arctic Offshore Patrol Ships courtesy Canadian Forces. The Coast Guard already uses Resolute Bay to store environmental response kits and to effect crew changes and resupply. Installation of an appropriate fuel tank farm would permit Resolute Bay to become a refueling facility to support their Arctic Archipelago operations. Transport Canada could utilize an air traffic control radar erected at Resolute Bay to increase radar coverage in support of transpolar flights and search and rescue operations. The radar facility could be integrated into Canadian Forces’ contribution to NORAD operations by providing additional coverage north of the North Warning System, which is currently established along Canada’s Arctic continental coastline, leaving the Arctic Archipelago with limited or no coverage. Natural Resources Canada already uses Resolute Bay to provide weather services and to support research in the Arctic through its Polar Continental Shelf Program. It is recognized that we lack a solid understanding of global warming as it affects the Arctic. To the extent increased research is merited in the Arctic, it would be well supported by an enhanced facility. The establishment of a multi-purpose facility in Resolute Bay would improve the delivery of services to other government departments such as the Royal Canadian Mounted Police, whose members could be deployed to deal with security issues in support of other departments or deployment of their Immediate Reaction Teams as required; The Border Services of Canada (BSC) and Immigration Canada, to facilitate the clearing of people who use Resolute Bay as a first point of entry into or exit out of Canada (the cruise ship industry has been using Resolute Bay for that purpose for a number of years); Canadian Security Intelligence Services, to gain a better understanding of the Arctic environment; Fisheries and Oceans, for their fisheries patrols; and Environment Canada, for their ice patrols. It would provide a command and control centre for regional military and civilian disaster-response operations. The facility would be used on a seasonal basis. During the active shipping season, the facility would see a peak in operations. Some personnel would be permanently stationed in Resolute Bay while others could be added to deal with increased activity. Increasing the capacity of Resolute Bay would convey the message that by transiting the Northwest Passage one will invariably have to sail in front of this federal government facility. My concern is not with responsible shipping companies that consider the Northwest Passage an economically viable route; such firms will have purpose-reinforced hull vessels, qualified pilots, suitable equipment, appropriate maps, insurance and so on. My concern is with the fly-by-night, uninsured or unscrupulous operators who may have little regard for the environment, criminal elements, or the activities of rogue nations that may attempt to move illicit goods or weapons through this area in the hope of being undetected. An approach drawing upon the full range of federal and territorial resources will increase opportunities for gainful employment for the people of the Arctic. Many of the operational and support positions could be filled by the residents of Resolute Bay and the adjacent Nunavut communities. Such employment would be challenging, rewarding and contribute to improving the capacity of northern residents. Developing Resolute Bay further may bring fringe benefits, such as increased eco-tourism, and commercial opportunities, such as cold weather testing of aircraft, vehicles, and equipment, and an alternative runway for polar flights, providing fuel savings for airlines. As such, the development could be done through a PPP (public-private partnership) program. The cost of the installation could count toward our commitment to spend 2 per cent of GDP on defence. More importantly, developing Resolute Bay as an Arctic security hub will support the surveillance and enforcement of Canadian law over the internal waters of the Arctic Archipelago. Colonel (Retired) Pierre Leblanc is a former Commander of the Canadian Forces in the Arctic. What’s next for Canada’s northern strategy? Canada is leaving the Arctic to Russia and the U.S.
BAE's NEW BVS10 BEOWULF: Can it handle the Arctic?